Gin is for lovers...and just about anyone else with a taste for cocktails, spirits, and the hearty company of like-minded souls. On Wednesday, February 13—Valentine's Eve—join The Museum of the American Cocktail and Pomp & Whimsy Gin Liqueur for a gin cocktail and tasting party featuring the woman who quite literally wrote the book on the spirit, noted drinks writer Lesley Jacobs Solmonson, author of Gin: A Global History and Senior Editor at Chilled Magazine. Across three cocktails created by Drinkmaster Sarah LM Mengoni and an expert-led tasting of a wide range of gins, genevers, and gin cordials, Lesley, with the participation of Dr. Nicola Nice, creator of Pomp & Whimsy, will illustrate the evolution of gin from its earliest days as a medicinal juniper-based tonic to the current explosion of artisan expressions. Admission includes a selection of gourmet bites created by Chef Octavio Rosales and promises a memorable evening inside Double Take at Hotel Palomar, a dining hotspot in LA's exclusive Westwood neighborhood. Tickets are $40 for National Food & Beverage Foundation (NatFAB), SoCal Culinary & Spirits Clubs, and Hospitality Industry members, $45 General Admission in advance, and $50 at the door (if available). NatFAB membership is available to all at natfab.org/membership. If it can be fermented or distilled, Lesley Solmonson will write about it, mix with it, and drink it. Her cocktail book, The 12 Bottle Bar, co-written with her husband, David Solmonson, was published in July 2014 and nominated for "Best Cocktail Book" at Tales of the Cocktail. She also authored Gin: A Global History and continues to evangelize about the wonders of the juniper spirit. She holds the title of Senior Editor at Chilled Magazine and is finishing her next book, Liqueur: A Global History. Lesley has contributed feature stories to the Los Angeles Times, Wine Enthusiast, Sierra, Private Clubs, and Liquor.com. She serves as Curatorial Consultant & Drinks Historian at The Museum of the American Cocktail. 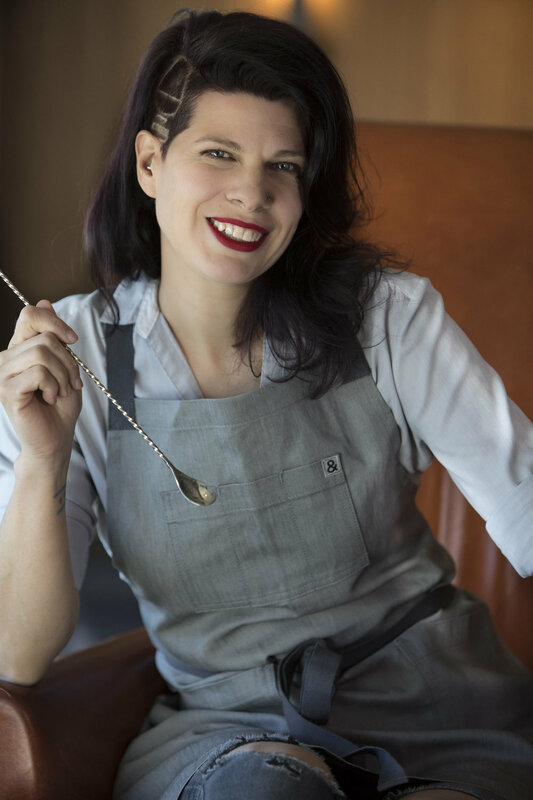 Both the force behind the bar program at Kimpton’s Double Take at Hotel Palomar Los Angeles | Beverly Hills and Co-Founder of spiritanimalbeverage.com, Sarah LM Mengoni is a veteran barkeep. She cut her teeth as a teenager in Michigan working at beer and shot joints. After a move to Chicago, she was initiated into the "World of the Cocktail," a world she embraced with enthusiasm. Now in LA, she carries on, grateful for the sunshine and the produce. Her original cocktail recipes have caught the attention of Food & Wine, Cosmopolitan, Imbibe, Food Network, and many others. Pomp & Whimsy, by infusing classically distilled gin with a delightfully flavorful botanical liqueur, brings modern sensibilities to the tradition of gin making. Founded by Dr. Nicola Nice, a trained sociologist, self-confessed cocktail obsessive, and advisor to some of world’s top spirits companies, Pomp & Whimsy is a cordial style gin inspired by the female culinary writers and home brewers of the Victorian era. In an industry where women are rarely given center stage, Nicola is bringing fancy, modernity, and even a touch of femininity, to this wonderful old world spirit. Situated in the midst of Westwood, on Wilshire Boulevard between Beverly Hills and UCLA, Double Take at Hotel Palomar is a dining hotspot inspired by the Hollywood backlot. Chef Octavio Rosales serves up unfussy, market-inspired snacks, salads, and entrees that shine with Southern California ingredients. Grab a hot coffee and house-baked pastry on your way in the morning or linger over lunch while working in the lounge. After work, let Sarah LM Mengoni’s seasonal and film-inspired cocktails mellow you into evening.